Cancer prevention is something we can all do. Just think of all the friends you know and family members that have had cancer. The life-changing emotional toll as someone you love goes through treatments. Not to mention the enormous cost. It is estimated that 95% of the cancers that occur are preventable from a healthy lifestyle. That is a huge number. That information is not new and it is available on the American Cancer Society webpage. Setting yourself up in a healthy lifestyle is your best insurance against developing a cancer. Though not a guarantee, it is the closest you will be able to come to living cancer-free. Cancer prevention is as simple as eating a diet high in vegetables, grains, beans, and fruits. Full Body 30 Day Vegan Cleanse is a great program to learn how to truly eat healthfully and in a way that is cancer preventive. This 30 Day Vegan Cleanse has changed people’s lives. By following this program, people lost weight, felt more energetic, had less body aches, a big increase in mental clarity and felt much better every morning when waking up. Many of the people who have already taken this Full Body 30 Day Vegan Cleanse keep these recipes in their diet regularly because they loved the foods and felt so much better. Every one of these people also know that by eating this way, they are doing the best they can for themselves and their families to prevent cancer. Pictured is a dinner of Adzuki beans I made for my family. Adzuki beans are known to help prevent cancers of the breast, if eaten on a regular basis; and also colon cancer due to all the fiber the beans contain. Research is also pointing out that Adzuki beans can help lower the risk of getting other types of cancer too. 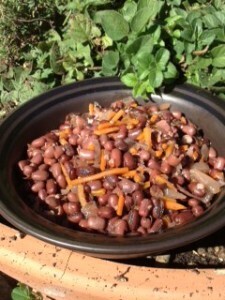 There is a great recipe for Adzuki beans in the Full Body 30 Day Vegan Cleanse. 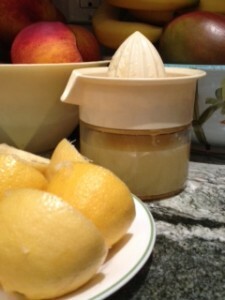 The base for the yummy and refreshing smoothie I made for the boys was fresh lemonade! It doesn’t get better than this!!!!!! Citrus fruits have so many benefits that staying healthy with citrus fruits is easy. Once you read all these health advantages you will see why you should have a citrus fruit 5-7 times a week. Citrus fruits are so good for helping the body with metabolism. Lemons and grapefruits help to keep insulin levels low, translating to your body utilizing calories instead of storing them. Stored calories become fat. Lemons and grapefruit then also allow your blood sugar levels to remain more constant. Avoiding highs and lows, and not having dips in blood sugar means you will not have sugar cravings. It is through this mechanism of keeping insulin levels low that is the cause for your metabolism being increased. Hence, the very popular Grapefruit diet, that actually started as far back as the 1930’s. There are several phytonutrients in citrus fruits that help reduce inflammation and reduce blood clotting. By reducing inflammation and blood clotting, citrus fruits are very helpful for your heart. Some studies have shown that people who consume higher amounts of citrus fruits have less heart disease and stroke. All of that has to do with reducing inflammation. Citrus fruits also provide a good dose of fiber, which helps to keep the bad cholesterol down and good cholesterol up. This is also helpful for your heart. Once you think about just these benefits for your heart alone, staying healthy with citrus fruits is a no-brainer. Why would you Not regularly eat citrus fruits? All the benefits our body’s receive from citrus fruits is due to the phytochemical composition. Citrus fruits provide flavanoids which reduce inflammation. Flavanoids also help remove free radicals, so citrus fruits have an anti-oxidant effect, which is always helpful to reduce the risk of cancer. Citrus fruits also supply us with, potassium, folate, B6, calcium, magnesium, phosphorus, pantothenic acid, riboflavin, thiamine, and niacin. With so many helpful fabulous nutrients – how can you go wrong!!!! And of course, we all know that citrus fruits give us a whopping dose of Vitamin C. Vitamin C is in constant demand in our bodies. It is needed constantly to scavenge for free-radicals. It is helps reduce inflammation. And Vitamin C is needed to help your body regenerate cartilage, keep your skin elastic and smooth. Your brain benefits tremendously from citrus fruits. Between all the fiber, anti-inflammatories and phytonutrients your brain is very well protected in the development of Alzheimer’s Disease, Parkinson’s Disease and other dementia’s. which all have inflammation is a core component. Numerous studies have all pointed to anti-cancer benefits from a diet high in citrus fruits. There are a number of the phytonutrients that play a role in this ability. You can see it is a package deal. It is Very apparent that staying healthy with citrus fruits will make a difference to your life! Just that information on citrus fruits should be enough to get you thinking “If staying healthy with citrus fruits, 1 vegan food, can do all of that – what could 1 month of being vegan do for me?” Everything written about above is just some of the reasons to choose a vegan diet, even if for 1 month, as in the Full Body 30 Day Vegan Cleanse. Just think how wonderful you will feel everyday if you followed this Cleanse just like so many others. Just think about how much better your health could be and as a result, how much better your quality of life can be! This is the perfect time for you to make a dramatic difference to your health. You can order Full Body 30 Day Vegan Cleanse by going to the website Full Body Vegan Cleanse.